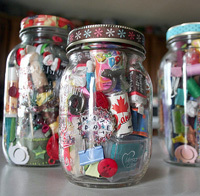 Whimsy Jar: A Summertime Welcome! SUMMER TIME EDITION!! Sender's Choice! 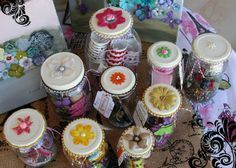 Do your best when putting together these whimsy jars! Please follow the instructions. Remember this IS sender's choice, however that being the case PLEASE NO JUNK! Do not just open up a junk drawer and grab a handful, be thoughtful with what you send your partner! Remember, we want to make their day ^_^ Put together something that you would enjoy receiving if it were your gift, something that you're super proud to share with someone else! We want to warm our partners heart with our lovely package! Not leave them feeling a bit deflated by receiving someone's throw aways. We'll be using a 4oz baby food jar, or a jar of equal size. You're more than welcome to create a larger jar if you wish, however the requirements are just a 4oz jar. I am allowing a good amount of time for sign ups, and two weeks after sign ups to send. Since this is senders choice you can start putting goodies together now! We will also decorate the lid to our whimsy jar after we've filled it! 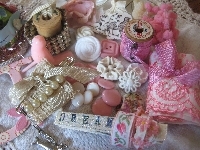 Cover it in fabric with lace, or decorative gems, or even decoden it with whip/cabochons, whatever your heart desires! Remember to include both your Swap-Bot name and the name of this swap, on a little card or memo! Of course glass jars can be heavy, even baby food jars, so plastic containers would be suitable as well. Items should be LOOSE inside of the jar. If you purchase something wrapped, such as a blind bag toy or a bag of tiny erasers, buttons, etc, you should open the bag and dump the loose items into the jar. The idea is to put the tiniest things on the bottom, then layer items by size as you fill to the top, with the largest items up top, to fill as much space of the jar as possible! I've included images for examples, and will post more images below in the comment section! Tiny figures or toys! Little sea critters, crabbies, sea horses, mermaids, little sea shell do dads etc! Sticker flakes, or cut out stickers that are summery! You could create phone charms or keyrings out of polymer clay or resin and include some of those! You could include inchies or little tiny papercrafts like those origami stars or tiny paper cranes! Cabochons, buttons, or decorative gems! Flowers, or animals that make you think of summer! These are just suggestions. There's tons of things you could add! Use your imagination ^_^ Of course handmade goodies are welcome if you'd like, though please do your best! Remember, DON'T JUST CLEAR OUT YOUR JUNK DRAWER! I will be very diligent while checking profiles for this swap, since there is a lot involved. No participants with ratings lower than 4.99, must have 50 completed type 2 and or type 3 swaps as well as positive ratings for those 50 swaps, and no recent 1s or 3s. (Recent = within 1 year) I reserve the right to ban as needed, and I WILL do so. Also, this swap IS USA only however due to the size of the jar, and depending if you use a glass or plastic jar this will be a bit heavy, so please be mindful of shipping costs, as they will cost much more to send than some of our smaller or lighter swaps! Don't forget to include a note with your swap handle and the name of the swap! If I've missed anything, or if you have any questions or comments, feel free to let me know! This is US only though any of my International swappers feel free to create an Int version if you'd like! Sorry for the late assignment! I ended up working several extra shifts the last few days and finally got some down time! I appreciate all of your patience ^_^ I'll be moving the send by date accordingly to compensate! My apologies again!